Clear out your mercury. Clean up our environment. Mercury is a toxic pollutant that threatens the health of humans, fish and other wildlife. By recycling mercury-containing products, you can help reduce the amount of mercury entering our environment. Bring your mercury-containing products to the drop-off location nearest you and we’ll recycle them for you, free of charge. Pick-up information: Call 1-888-303-2103 to schedule pick-up or book online. *Heating contractors can get involved by recycling old intact mercury-containing thermostats. Email our partners, Scout Environmental at switchthestat@scoutenvironmental.com to register for Switch the Stat and receive a collection container and a pre-paid return Purolator waybill – it couldn’t be easier. Use the map below to find the Mercury Collection drop-off location nearest you. There are drop-off locations across Nova Scotia that will accept mercury-containing products free of charge. Please note: many drop-off locations do not accept every type of product. Please click “View Details” and check the list of Accepted Products to ensure your materials will be accepted by your chosen drop-off location. Pick-up information: Call 1-877-688-3065 to schedule pick-up. For additional information, call 1-877-999-6035. For high-volume of eligible products, we offer no-cost pick-up from your site. Contact us with details of your products and location. Please ensure to add “NS” to your location searches to avoid being shown maps outside of Nova Scotia. If you are a contractor, please ensure you review the “Contractor Drop-Off Location Guidelines” listed below the drop-off location tool. Thank you for doing your part to reduce mercury entering the Nova Scotian environment. 1) Drop-offs are limited to a maximum of 500 pieces per participant per drop-off location per day. If you are located in Halifax Regional Municipality (HRM) and have over 500 pieces of lighting products, please bring them to Dan-X Recycling in Dartmouth, at 64 Trider Crescent (Burnside Industrial Park.) If you have over 1,000 pieces of lighting products, please contact us for a no-cost pick-up from your site. If you are located outside of HRM and have over 500 pieces of lighting products, contact us to arrange a no-cost pick-up from your site. The program reserves the right to decline any pick-up requests at our discretion, such as where we determine the pick-up crews might be exposed to hazardous conditions in the course of a pick-up. 2) All products to be dropped off must be packaged securely in walled-containers such as boxes. 4) Do not leave any products outside a drop-off location. 5) Do not drop off any products after-hours. 1. Why should I recycle mercury-containing products? By recycling products that contain mercury, you can help reduce the amount of mercury entering the Nova Scotian environment. 2. Is there a fee for recycling mercury-containing products? There is no cost for you to take advantage of this service. 3. If this service is free, who pays for it? This program is funded by Nova Scotia Power. 4. 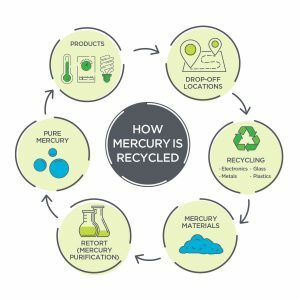 How are mercury-containing products recycled? We try to make it easy for you to responsibly dispose of your old products. To ensure responsible handling of the materials at every step of the process, a rigorous chain of custody procedure is in place from product collection to chemical processing. 5. Does my fridge or freezer contain mercury? Many chest freezers that were manufactured prior to 2001 contain mercury. Regardless if yours does or not, we can pick it up and properly recycle it, plus we’ll give you $30. Learn more. 6. Why are CFLs considered “green” if they contain mercury? For many years, CFLs were the first choice in lighting because they were more energy efficient than incandescent lighting. Now that LEDs are readily available and affordably priced, they are quickly replacing CFLs as an energy efficient, green lighting solution. 7. Do I need to remove the mercury from the product before I drop it off for recycling? Please keep mercury-containing products intact when dropping them off for recycling. For safety reasons, do not attempt to remove mercury yourself. In the event of a spill, follow the Environment and Climate Change Canada guidelines for cleaning up small mercury spills. 8. I’m unfamiliar with some of the mercury-containing products listed. Would I have some of these products in my home? If you’re not sure, check out Environment Canada for a detailed description of mercury-containing products. Efficiency Nova Scotia, in partnership with Scout Environmental, are proud to offer free mercury collection and recycling. Register for Switch the ‘Stat to have mercury collection completed right at your business location.